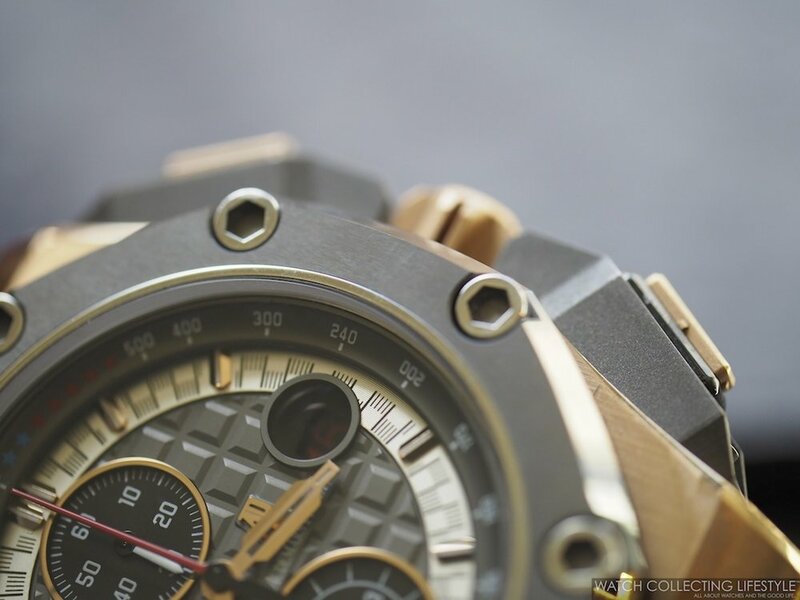 Rare Bird: Audemars Piguet Royal Oak Offshore Schumacher Rose Gold Limited Edition ref. 26568OM. The Second and Last AP Watch with a Cermet Bezel. It's been almost five years since the freak skiing accident that put Michael Schumacher in a coma on December 29th, 2013. 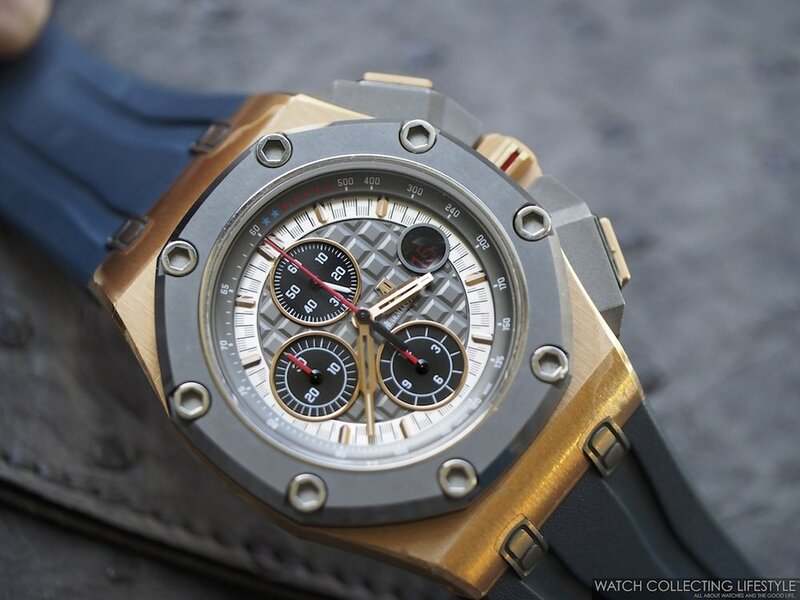 While today we don't know much about Schumacher's condition, other than he was out of the come a year after his accident, the one thing we know is that the Audemars Piguet Royal Oak Offshore 'Schumi' is the best and nicest limited edition watch to ever honor one of the greatest Formula One drivers that has ever lived. Available in Titanium, 18K Rose Gold and Platinum, this limited edition along with the Rubens Barrichello —titanium model here, rose gold model here and the platinum model here— are two of the most coveted AP Offshores of all time. While the watch was originally supplied with a grey rubber strap like the one on the titanium model, replacing that original strap with a blue strap from the platinum Schumi makes this watch look even better. This watch marks the second use —after the Jarno Trulli released in 2010— of Cermet by Audemars Piguet and all three 'Schumi' watches were fitted with the same type of bezel. The 'Schumi' in 18K rose gold ref. 26568OM.OO.A004CA.01 is limited to 500 pieces, while the titanium and platinum references are limited to 1,000 and 100 respectively. Cermet is a very advanced composite typically used in creating heat shields for space shuttles and its name is the result of the contraction of the words “ceramic” and “metal”. Cermet is anti-corrosive and extremely hard with a hardness rating of 1,450 Vickers. The Schumi is fitted with a stunning grey dial with anthracite galvanic center featuring 'Méga Tapisserie', alternating checkered flags on the outer ring of the dial and black galvanic chrono registers with raised surrounds in 18K rose gold. The flange is also made of anthracite with a tachymeter scale in white and a total of seven stars between 12 and 1 o'clock to commemorate Michael Schumacher's seven Formula One World Championships. The seven stars are divided into two colors; two blue stars honoring Schumacher's victories with Benetton and five red stars honoring his victories with Ferrari. The calendar wheel is black and the date font is red. The crown and pushers are almost identical to those on the Royal Oak Offshore Grand Prix Limited Edition. 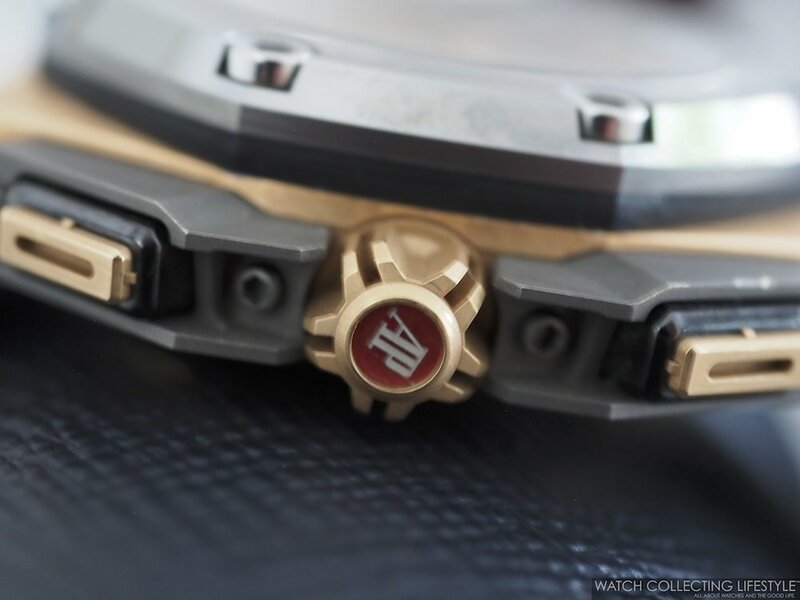 The racing nature of this watch is present in every single detail of it. The subtle racing design aspects include the titanium plots shaped after gas pedals, the crown guards after cooling scoops, the crown reminiscent of a gear and the case back styled after wheel spokes. And of course the icing on the cake are the hexagonal screws on the bezel and the case back that add a very automotive touch to the overall design. The case back is fitted with a sapphire crystal allowing for a full view of the Audemars Piguet calibre 3126/3840. This calibre featuring 59 jewels, 365 parts and a rotor with Michael Schumacher's racing logo provides a power-reserve of 55 hours when fully wound. One of the most fascinating APs out there commanding prices way way above its original retail price of $75,000 USD back in 2012. This fantastic reference is a must have for all those of you looking to have one of the most coveted Royal Oak Offshores of all time. Now, if you think that the gold reference might be too flashy or too much for you, you could always try to find a titanium one —which originally retailed for $42,500 USD— or a subtle looking platinum reference —originally retailed for $110,000 USD. If you find one, expect to pay anywhere between $90,000-100,000 USD based on the availability of box and papers and the overall condition of the watch. 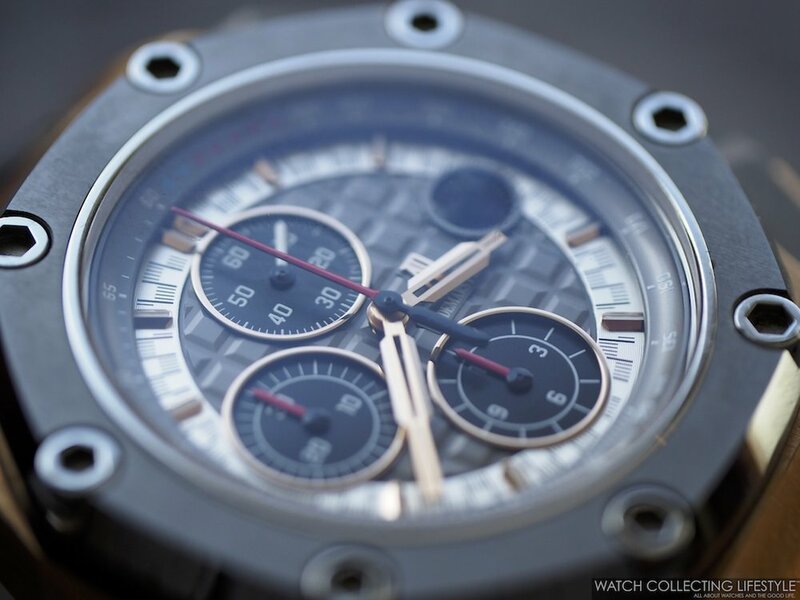 Posted on September 5, 2018 by Editor & Publisher and filed under Audemars Piguet and tagged Royal Oak Offshore Chronograph Michael Schumacher Audemars Piguet Michael Schumacher Limited Edition Michael Schumacher Limited Edition Offshore Audemars Piguet Limited Edition Schumacher 2018 Audemars Piguet Rare Bird Mainstream Brands Audemars Piguet ref. 26568OM.OO.A004CA.01 Royal Oak Offshore Schumi Most Popular.